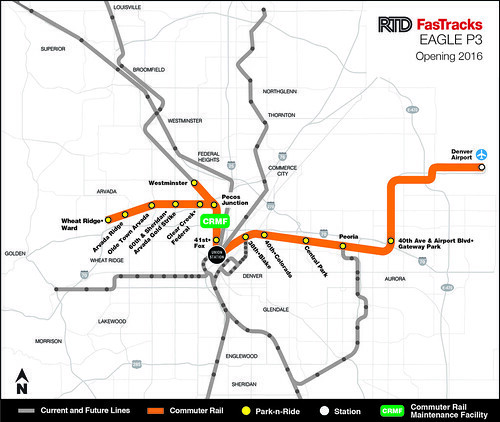 The Eagle P3 Project is being delivered and operated under a concession agreement that RTD has entered into with a "Concessionaire" that has been selected through a competitive proposal process. The selected Concessionaire is known as Denver Transit Partners (DTP), a special purpose company owned by Fluor Enterprises, Uberior Investments and Laing Investments. Other leading firms involved in the team include Ames Construction, Balfour Beatty Rail, Hyundai-Rotem USA, Alternative Concepts Inc., Fluor/HDR Global Design Consultants, PBS&J, Parsons Brinckerhoff, Interfleet Technology, Systra, Wabtec and others. The Eagle P3 Project concession agreement requires DTP to design-build-finance-operate-maintain (DBFOM) the East Rail Line, Gold Line, Northwest Electrified Segment (NWES) (segment 1 of the Northwest Rail Line) and the commuter rail maintenance facility, all under a single contract. RTD will retain all assets while shifting much of the risk of designing and building the project to DTP. The Concessionaire has also arranged around $450 million of private financing for the project. This allows RTD to spread out large upfront costs over approximately 30 years, making it more affordable, much like a 30-year home mortgage. In return, RTD will make annual service payments to DTP based on their performance of the operation and maintenance of the project through Dec. 31, 2044. The Concessionaire will provide, operate and maintain the rail vehicles for the three commuter rail corridors. The same vehicles also will be used on the RTD FasTracks' North Metro Rail Line, which is being built separately from the Eagle P3 Project. The North Metro Rail Line team has purchased the additional vehicles it will require, and that project also has funded the construction of additional space at the commuter rail maintenance facility to operate and maintain its additional vehicles. The rail vehicles are similar to those supplied to the Southeastern Pennsylvania Transportation Authority (SEPTA) in Philadelphia. East Rail Line; Gold Line; Northwest Rail Line; CRMF.